Check back at a later date for information on our 2019 Summer Sing. In 2018 our 5th annual Summer Sing was held at the Historic Meeting House in Francestown. The chorus sang excerpts from Semele, interspersed with dramatic narration. Semele (HWV 58) is a 'musical drama', originally presented "after the manner of an oratorio", in three parts by George Frideric Handel. Based on a pre-existent opera libretto by William Congreve, the work is an opera in all but name but was first presented in concert form at Covent Garden theatre on 10 February 1744. The story comes from Ovid's Metamorphoses and concerns Semele, mother of Bacchus. Handel also referred to the work as 'The Story of Semele'. The work fuses elements of opera, oratorio and classical drama. Semele was presented during Lent, one of Handel's regular oratorio seasons. However it was not what London audiences were expecting of an oratorio during the solemn season of Lent- Semele has a secular text with a story involvingan adulterous sexual relationship. It is distinguished from Handel's operas by the large number of polyphonic choruses. Semele was performed four times during its original run, and twice again later the same year, but those were the only performances in Handel's lifetime. 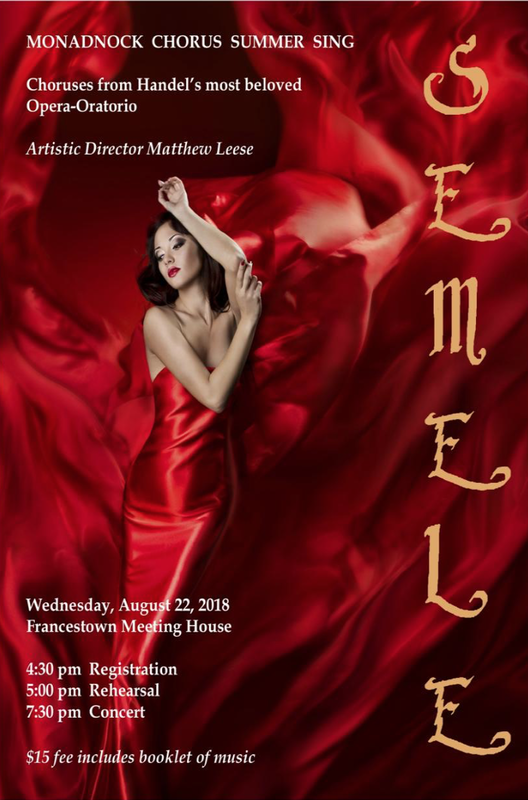 Today Semele is frequently fully staged and receives regular performances at many of the world's opera houses, as well as performances in concert form. Story synopsis: Jupiter, King of the gods, takes the mortal Princess Semele to a secret hiding place on a mountain to be his mistress. When Jupiter's wife, Juno, hears of her husband's adultery she is enraged, and plots to ensure Semele's downfall. In disguise, Juno appeals to the girl's vanity and persuades her to insist on seeing her lover in his divine form. Jupiter reluctantly agrees but his thunderbolts burn and consume Semele. From her ashes, though, arise her unborn child by Jupiter - Bacchus, god of wine and ecstasy.